The second course of tonight’s geez-it’s-hot-inside feast was this gazpacho, a chilled tomato-veggie soup that was incredibly fresh tasting, and Lisa’s favorite dish of the night. We liked this one better than the one featured in Great Bowls of Fire, which seemed closer to salsa than soup. I halved the recipe listed below, which like the others from tonight is from Healthy Latin Cooking. Seed and finely chop 1 of the tomatoes; set aside in a small serving bowl. Quarter the remaining 5 tomatoes. Finely chop 1 cucumber; set aside in a small serving bowl. Finely chop 1 quarter of each bell pepper; set aside in a small serving bowl. Finely chop 1 onion quarter; sed aside in a small serving bowl. Finely chop the scallions; set the scallion greens aside in a small serving bowl. 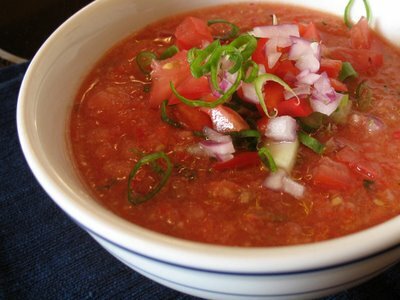 In a blender, combine the scallion whites, remaining onions, garlic, stock/broth, 4 tbsp of the vinegar, the bread, and the remaining tomatoes, cucumbers, and bell peppers. Puree until smooth. The gazpacho should be thick but pourable. Season with salt and pepper. Transfer the gazpacho into a large bowl. Stir in the parsley. Cover and refrigerate for at least 30 minutes for the flavors to mingle and intensify. Just before serving, season with more salt, pepper, and vinegar, if desired. Ladle into serving bowls and sprinkle a little oil on top. Set the bowls of chopped vegetables on the table and let each diner garnish as desired. This entry was posted on Thursday, July 12th, 2007 at 11:09 pm	and is filed under Healthy Latin Cooking. You can follow any responses to this entry through the RSS 2.0 feed. You can leave a response, or trackback from your own site. Fine dinning is never out of season!